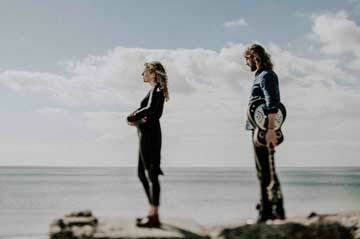 Harbottle and Jonas combine the rich traditions of folk music with original and contemporary interpretations using a blend of closely intertwined vocal harmonies. Each song has been carefully written and researched, and accompanied with a great story and a good deal of humour; however macabre the content may be! Their songs cover a range of social, political and historical issues. They also sing about the family, the Devil, Malcolm and Grimsby. Their music is original and unique and performed with integrity. Each performance establishes a warm rapport, engagement and interaction with the audience. “Stunning song-writing and heart-rending arrangements” Americana UK. “Damn fine“ Mike Harding. BBC Radio 2. Advance tickets are £10 and will be available from the Brockweir and Hewelsfield Village shop about 4 weeks before each event or from Adrian Birch brockweirevent@gmail.com, or 01291 689812. £12 on the door. Doors Open 7.30. Performance 8.00. Refreshments available. BYO alcohol. Supported by Air in G.
“Handmade Tales” - 3 evenings of comical stories, satire, sonnets and songs from some of Britain’s brightest bards and balladeers, taletellers and troubadours, raconteurs and rhymers. All brought together by local, Darren Hoskins, storyteller, shepherd and escapologist. Facebook - Handmade Tales. Tickets £8.00, phone 07866 697512, or available at the door. 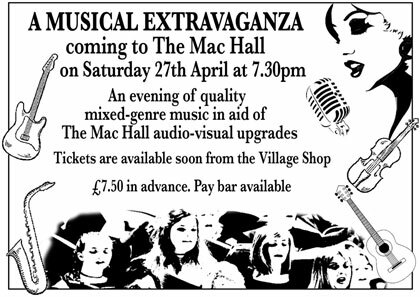 An evening of first class musical entertainment in aid of the Mackenzie Hall Stage and Audio improvements. Something for everyone, from Jazz to Rock to Choir to classical. Note, you are advised to contact the organiser before turning up to any of the following events as times and dates may vary.